So here are my thoughts, unedited and extremely rough because I told myself to stop over-analyzing this book after the first eight chapters. Julie Kagawa weaves a very magical, creative world with the Fey kind -- the Summer and Winter Courts, the emergence of the Iron Fey, Oberon, Puck, Ash, and all of the other faery that appear throughout the books (both first and second). I even appreciate the adventure and the mission of defeating the Iron Fey and retrieving the Sceptor of Seasons. It's a very well planned, intricate adventure. And, BOY, do I love me some adventure! But all of that got severely overshadowed by two very large factors that made me frustrated by the progression of the story line. 1) Meghan -- I can't find it in me to like her. I've been trying so hard because I know that there must be reasons why she does things the way that she does. She has so much potential to blossom into a relatable, kickass heroine. But in the end, she's a very gullible, sensitive, selfish, and sometimes stupid teenage drama queen who needs to just stop and think before she speaks or acts. For some time, everything seemed to be about HER insecurities, HER love for Ash, HER suffering and sacrifice, HER humiliation or dignity... It got old real fast. For a long time, while reading this second book, I'd been trying to figure out what role Meghan was supposed to be playing outside of narrator. Because she was pretty much useless to everyone despite the fact that she insisted on being present for all the important events; and I asked aloud, "What good are you going to be for everyone?" Because she seems to have a really good talent for putting herself and others into danger while she hides behind protectors at every bend. On top of that, she's got an EXTREMELY selective back bone (probably because her priorities are a little skewed). But enough of her negatives. In the end, I'm at least glad that things got explained -- why her powers weren't working, I mean. And I'm glad that we at least see some of that potential sparking in her once again when she discovers a new form of power in herself (which was kind of predictable, but I'll take what I can get). I don't completely despise her. She just frustrates me to no end. But I'm still holding a small flame of hope for the rest of the series. It's just... It's BOOK TWO and you're still a fearful, crying mess with no backbone, and THAT is what frustrates me about her. Add onto that her "love" for Ash... and things just get really cruddy for my brain. There are few books that I actually banged my head against because I couldn't physically slap some sense into the main character. The first and only other book that I did this with was Twilight. And now, I have done it with The Iron Daughter. It's when I KNOW that frustration is too overwhelming. 2) The romance -- I already mentioned in the first review that I thought the development of Ash and Meghan's romance was too premature. They barely knew each other -- they STILL barely know each other. But they act like they've been in love for centuries. Instalove is one thing, but this type of romance, bordering on an unhealthy obsession due to one's own runaway emotions? It drives me totally NUTS! I'm even setting aside the fact that Ash was in a deep love not long ago and had watched that girl, Ariella, die in his arms and that he might still hold a flame for her. How he managed to fall in love with Meghan without too many reserves was pretty hard for me to take -- and that little moment where he mentions that Meghan reminded him of Ariella... And then the whole "I'm treating you like dirt in order to keep you safe" thing... sigh. I hate those devices. They're highly unnecessary, because the girl never gets it and in the end, you get more misunderstandings and more deaths than you would have expected. Which brings me to that whole self-absorbed Meghan Chase issue (apparently I still had more negatives about her): ANYONE with eyes could see that Ash was deliberately treating her coldly to keep her safe (even if I don't like the way he goes about it), but Meghan was stuck in her own "woe is me" world, and HER own misery and sufferings, blinding her from seeing what was really going on. I'm not saying Ash was right in his actions, but I want to point out that Ash had already warned her, not once, but twice, that emotions were seen as weaknesses in the Unseelie Court, and that she needed to learn to control her own emotions. He as good as TOLD her that they couldn't show their emotions, and she needed to be strong about how she was going to get treated. Even if not in as many words. So what does she do? She gets mopey about it, and cries about it, and then has a short interlude where she wears all black to reflect her "I'm going to show you how cold-hearted I can be by wearing all black and acting like I don't care, and obviously I'm not depressed about you." Of course, this interlude lasts a whole of 30 seconds and it's super ridiculous; because I've done the same thing when I was a teen and it was still super ridiculous because it does nothing at all! 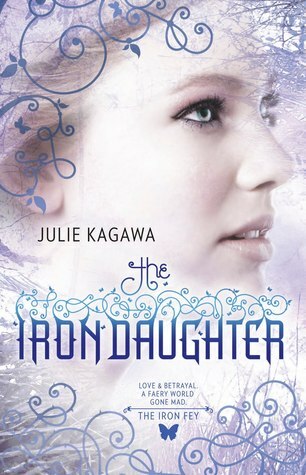 Backtracking to The Iron Daughter's overall story line -- I honestly DID enjoy a lot of moments in this book. And the sad part is, for a hopeless romantic like me, it had been the moments that Meghan and Ash were separated that her presence was a bit more tolerable to me -- when she had her mind focused on other priorities outside of her unhealthy obsession with Ash. To the point, this was a good book with a great adventure and the only thing that ruined it for me happened to be the romance. Because I can still deal with Meghan being an underdeveloped heroine; there are two books left to go and hopefully some room for her to grow. It's just a bit of a disappointment to me that Meghan's development didn't stem from the conclusion of Book 1, but her irritating immaturity managed to continue on into Book 2. Nonetheless, this wasn't a bad book and the story line is still intriguing. I'm just glad I had other books to distract me before I plunged into the third book, because I really needed a break from Meghan. If not for her and the romance, I might have really, really liked this book. Although, I DO love Grimalkin! I think I did a little squeal when he showed up again. So I hope to see him again in the next two books. Because if anyone is going to keep me anchored to this series, I really think it's going to be that awesome, snarky, wise Caith Sith.